Mahila Arogya Vikas and Vikasa Tarangini of Vijayawada conducted Cancer Awareness camp in Mallepally Nalagonda district on 29/03/15. Dr. Rajitha garu gave her valuable service to the camp and also checked the followup cases for second opinion which is more appreciable. Dr. Venudhar garu thanked Swamiji for organizing camps like this which help the women a lot. 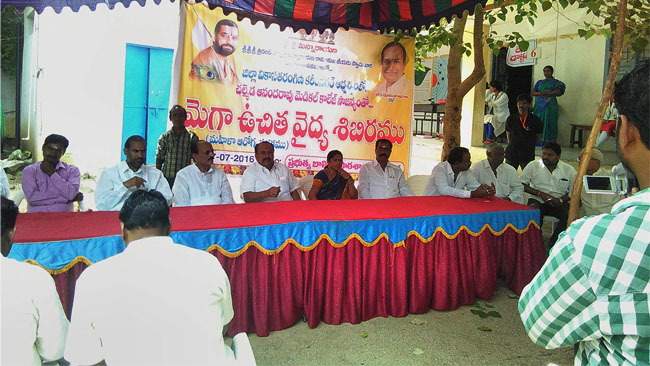 Even though its the first camp in Mallepally, the volunteers organized the camp very well. Vikasa Tarangini members of Mallepally, Jhanaki garu, Aruna garu, Vijayalakshmi garu gave there valuable service to the camp. O.P 97, V.I.A– 90, Followups – 17.